This node creates metaballs and metasurfaces. If you click and drag the mouse on the Construction Plane, it generates a metaball whose X radius is specified by your drag. Metasurfaces are generalized metaballs meaning that they aren’t necessarily ellipsoidal. Metaballs provide a method for creating an organic-looking surface. The metaballs are blobs ("fields") of "density" floating in space. Houdini skins a surface around areas where the density is greater than some threshold. When two metaballs overlap, Houdini adds their field effects together. Because the density of the force field can be increased by the proximity of other metaball force fields, metaballs have the unique property that they change their shape to adapt and fuse with surrounding metaballs. This makes them very effective for modeling organic surfaces. You can specify negative Weights to create "pusher" metaballs. This lets you create holes in the surface by effectively subtracting density. The field is controlled by a kernel function and a weight. The kernel function controls the gradient of the density value of a metaball field from 1 (at the center) to 0 (at its outside edge). The weight scales the density to shift the location of the surface closer or further away from the center. You can currently specify the shape of the field as an ellipsoid or a super-quadric. Click the Metaball tool on the Create tab. You can hold Alt to detach the metaball from the construction plane. Click to place the metaball anywhere in the scene view. If you press Enter without clicking, Houdini places the metaball at the origin. Press ⌃ Ctrl + on the Metaball tool on the shelf. If you are at the geometry level or have an object selected and you create a metaball, it will go into the selected object. If you are at the scene level and create a metaball, the viewer and the network editor will switch to the geometry level of the selected object. This unique feature allows you to merge multiple metaballs together automatically by creating them sequentially and close together. Metaballs can be moved once they are placed by either dragging them in the scene view or changing the values in the parameter editor. There are special handles available at the geometry level for the Metaball object that allow you to stretch and squash it. Move to the geometry level by double clicking the metaball node in the network editor or by clicking the Jump to Operator button on the operation controls toolbar. Drag the handles to squash or stretch the metaball. Merge the nodes together with a Merge operator. Create a single metaball and copy it onto the points of another piece of geometry with the Copy operator. 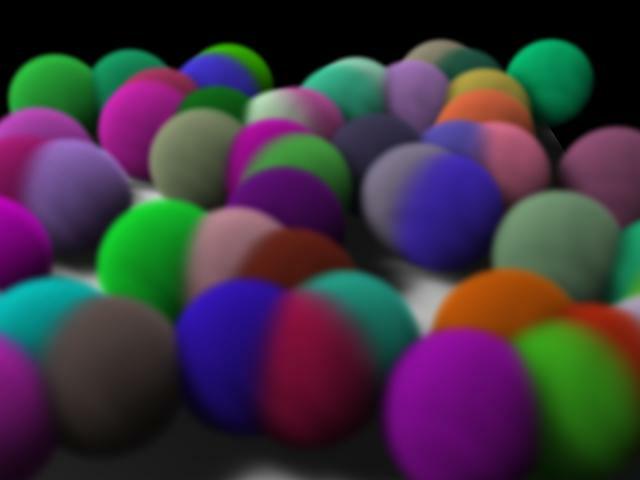 Copying metaballs onto the points of a particle system is a good way to achieve various volumetric visual effects. In the viewport options menu, choose Display ▸ Display options, or press D.
Click the Viewport tab and lower the Level of detail setting to get faster but rougher representations of geometry in the viewer, including metaballs. Instead of the regular ellipsoid field shape, you can increase or decrease the XY and Z exponent parameters to create "star-ish" (exponent > 1) or "square-ish" (exponent < 1). A metaball is known as a super-quadratic if either exponent is not equal to one. Each metaball has a "sphere of influence". When you merge two metaballs and they extend into each other’s sphere of influence, they react in a way similar to drops of water: the surface tension works to form a smooth bridge between them. This is useful for making organic "blobby" shapes which meld into each other. When two or more metaball force fields are combined, as in the illustration below, the resulting density of the force fields is added, and the surface extends to include that area where the force fields intersect and create density values with a value of one. For more information on Metaballs, see the Geometry Types section. You can see a metaball’s sphere of influence by turning on Display primitive hulls in the Display options toolbar. This node is ideal for creating organic models, liquid effects and other blobby surfaces. You can change the level of detail of the metaball and NURBS display by adjusting the Level of Detail parameter in display options. Accurate metaball normals will be computed if the normal attribute exists when conversion to polygons is done. Thus, to get improved shading on polygonized metaballs, it’s a good idea to add the normal attribute (i.e. use a Facet SOP) before converting the metaballs. This is typically done by copying metaballs to every point of the deforming a polygonal/mesh input source with a Copy SOP. When doing this, it is a good idea to pass any deforming geometry through a Facet SOP and Consolidate Points to minimize the number of points you need to copy to. If converting from spline surfaces, you may want to refine your surfaces first to get a smooth distribution of metaballs. If you are using metaballs to create a deforming attractor for the Particle SOP, you may want to use a Group SOP to define a bounding area, and copy the metaballs only to the points included in that group. This makes it much easier to control and animate the attractor area. Metaball expressions are user-specified attributes that determine how metaballs are to be merged. To use Meta Expressions, merge all your metaballs with groups. You can reference metaballs as groups or primitive numbers. Then, use an Attribute Create SOP to build a string detail called metaExpression. The attribute must be called metaExpression. Duplicate argument names are also supported by this expression. For example, if a metaball with primitive number 0 is defined, then specifying the expression sum(0, 0) is equivalent to merging two distinct metaballs at the same location as metaball 0. You can increase the Level of Detail on the Viewport tab of the Display Options to increase the accuracy at the cost of viewport performance and memory consumption. How to interpret the parameters used to specify the metaball. Treat Radius as a scale on the density field. The threshold surface is then a function of this Radius, Weight and Kernel Function. Treat Radius as specifying the radius of the 1.0 threshold surface for this isolated metaball, and compute the corresponding scale on the density field given this Radius, Weight and Kernel Function. Changing the Weight in this mode will not change the isolated threshold surface of this metaball. X radius of a metaball that is placed if you click on the Construction Plane without dragging. If you click and drag, the size of the metaball is over-ridden by the amount of drag. Entering non-equal values in the xyz fields results in ellipsoidal shapes. The X radius is defined by the distance dragged from the center, while the Y and Z radii vary proportionally with the X / Y and X / Z ratios in the parameter dialog. Center of the metaball. This value is updated whenever you click (and drag) to create a metaball. A new metaball will be positioned here if you type Enter. Rotation about the center of the metaball. How much "pull" the metaball has on surrounding metaballs, causing them to merge together. Always puts a sphere at the blob center, even if the weight is less than 1.0. The fastest and most stable of all the models. The Wyvill and Elendt models are very similar. Only the weight distribution function is different. The slowest method, but a good compromise between the Blinn and Wyvill methods in terms of weight distribution. A kernel function suggested by mathematician John Hart. Determines inflation/contraction in the x and y axes. > 1 = metaballs that appear more like a star. < 1 = metaballs that appear more squarish. 1 = metaballs that appear spherical. Determines inflation/contraction in the z axis. The Point SOP is used to provide a visual representation of how metaballs interact when their respective fields blend into one another in an additive fashion. Create a simple cat head by using the Bulge SOP combined with metaballs and a NURBS sphere. The Bulge SOP is used to deform geometry using a metaball as a magnet force. The magnitude of the magnet force can be adusted in the Bulge SOP. The parameters in the Metaball SOP may also be adjusted to modify the final effect of the Bulge SOP on the deforming geometry. This example demonstrates how to paint scattered points onto the surface of your geometry with a set number of points per area. This example demonstrates the how the Primitive SOP can be used to drive the attributes of other geometry. In this case it is used to affect the Weight Parameter of a Metaball SOP. In addition, the parameter can be animated over time. Press Play to see the animation.